Day for Night: O Brothers, Where Are We? 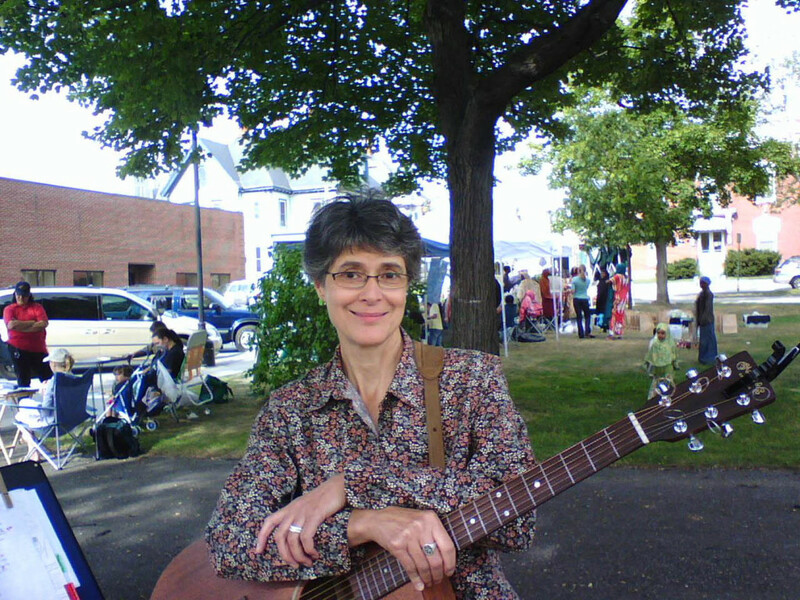 Gretchen Schaefer poses for a picture during Day for Night’s public debut, at the Lewiston (Maine) Farmers Market in July 2007. Hubley Archives. at a farmers market in downtown Lewiston, Maine. The market coordinator was a student at the college where I work, and I responded to her open call for musicians. The turnout of both vendors and customers was underwhelming (another blow to the Androscoggin Valley Chamber’s delusional “It’s All Happening Here!” promotional campaign). Whatever the folks running the market may have felt about that, though, it afforded Gretchen Schaefer and me a low-pressure setting to resume performing after a three-year hiatus. As we recall, it went pretty well. Market organizers allotted us a sunny patch of grass along the sidewalk, and we were OK with the lack of stage and amplification. Punctuating our music with changes from guitar to accordion (me) and to autoharp (Gretchen), we jittered along steadily through our two sets till late afternoon. There were a few compliments, some kids found us briefly intriguing, most people gave us exactly the kind of non-attention we were hoping for as we rediscovered our performing reflexes. Day for Night performs the Everly Brothers’ “Price of Love” at Bates College, Nov. 30, 2007. Photo by H. Lincoln Benedict. A low-key occasion to be sure, but nevertheless the start of Day for Night’s performing career — a career that has never been high-powered nor lucrative, nor bigger than local, but one that has over the years kept us on stage about as often as we can handle. and, as a corollary to that last, figuring out just what music we should be playing. Answering that last question was easy and hard. Easy because even in the depths of bossa nova madness in 2004–05, we knew that country music would always be Day for Night’s prime directive. Having drifted away from bossa nova, though, we next had to get serious about country, which meant figuring out just what country meant for Day for Night. That was the hard part. This prospect list from late 2007 shows the musical schizophrenia that I was inflicting on Day for Night. Note that the bossa nova prospects (none of which we ever tried) included sources like Graham Parker, Tom Verlaine and Elvis Costello. 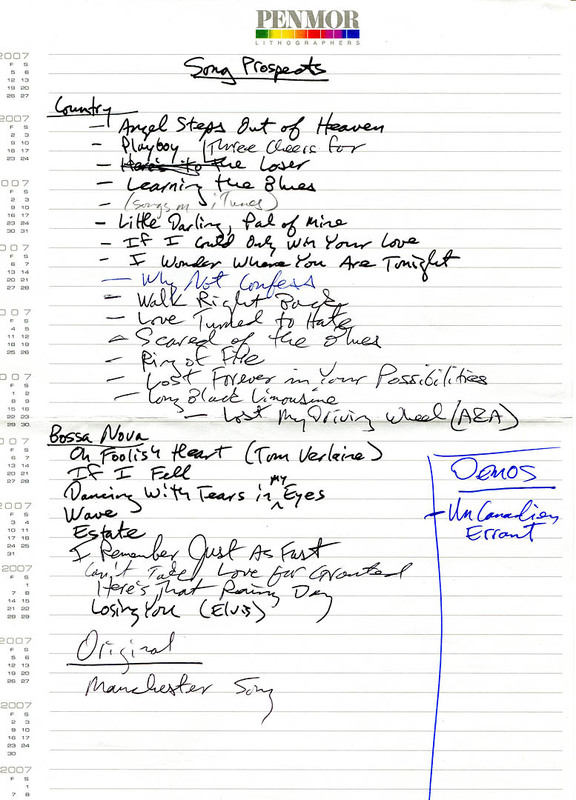 “Manchester Song,” by the way, finally took shape two years later as “Bittersweet.” Hubley Archives. Her own early playing, as a teenager with friends on acoustic guitars, explored the borderlands between country, pop and folk without worrying too much about categories. For Gretchen, the Child Ballads — Francis Child’s compilations of British folk ballads, those blow-by-blow narratives of intense love and death — were a powerful revelation in the 1970s. Today, the kind of country that she finds most compelling follows the path from those centuries-old ballads through the Appalachians to seminal players like Ralph and Carter Stanley. As for me, my lack of stylistic boundaries is a frequent refrain in these posts. 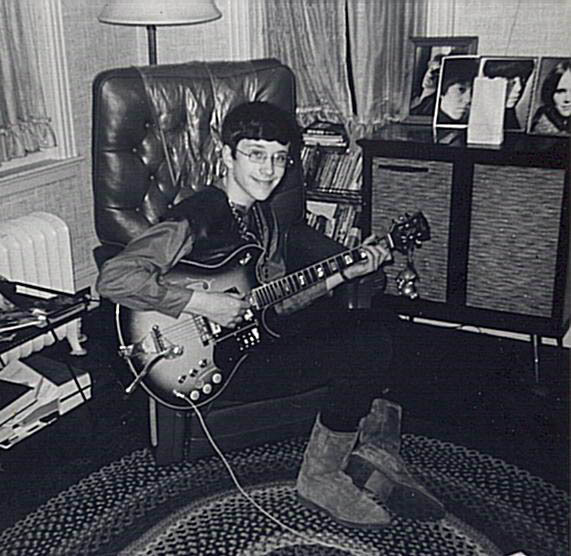 As a teenager, I was more concerned with means than genre: More than anything, I wanted to play electric music. Which affords a handy segue to a musician who had an important influence on my genre promiscuity — that is, he provided a broadly accepted rationale for it. Yes, in my perceived Lonely Guy™ solitude back there in the early 1970s, I was one among the millions around the world captivated by former Byrd, former Flying Burrito Brother Gram Parsons. 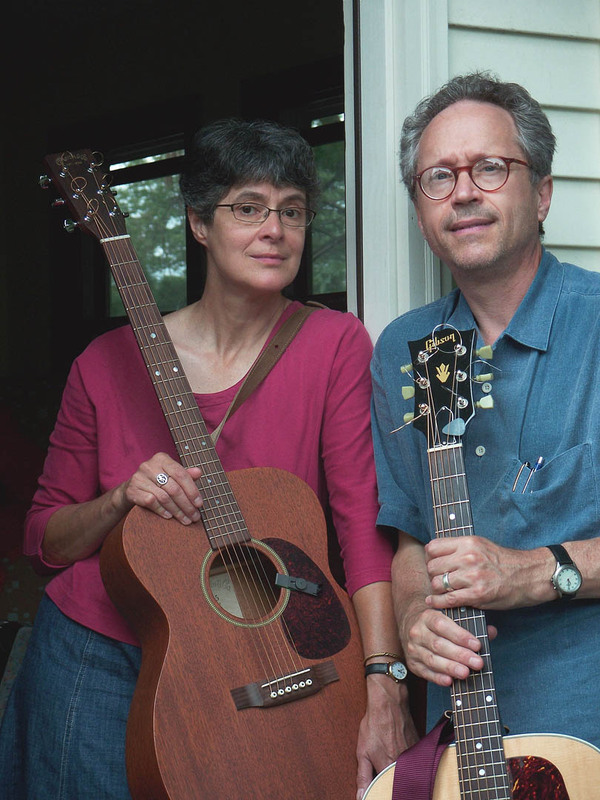 Gretchen Schaefer and Doug Hubley in a Day for Night publicity photo taken in 2008 by the Kodak self-timer. Hubley Archives. His singing was touching — especially with Emmylou Harris, as we’ll never let her forget, as if she could; his tragic story was highly romantic as long as you didn’t have to deal with the lawyers afterward; and his view of music was one that I immediately adopted as my own. While musicians have been crossing genres as long as there have been genres to cross, Parsons brought the concept back home to us hippies in the late 1960s with his notion of “Cosmic American Music” — a silly name for very appealing, and largely Southern, crossovers among country, rock and rhythm & blues. Such thinking struck naive me like a bolt from the blue — even after growing up with groups like the Beatles and the Rolling Stones that were essentially exemplifying the same thing, only without the pedal steel or Nudie suits. All that being said, Day for Night’s way-finding was a slow but agreeable process. In the beginning we had outstanding, if unsurprising, guides. We knew we wanted to emphasize harmony singing, and for that there were no better inspirations than the Everly Brothers and the Louvin Brothers. 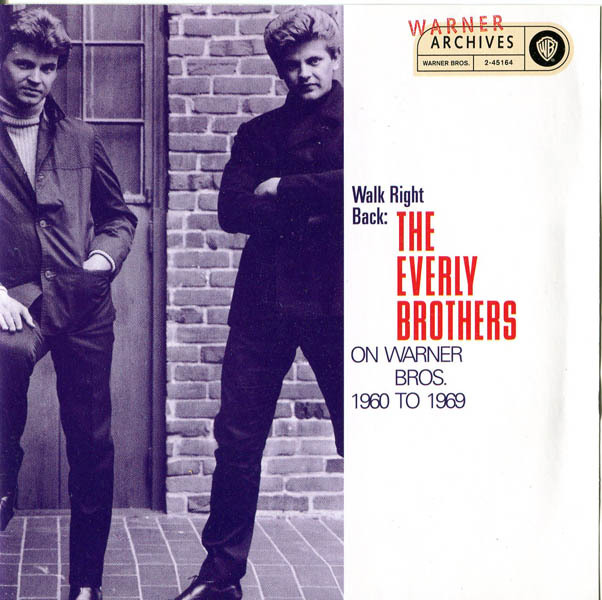 Coming from country music, the Everlys played rock-pop that often worked well as country (as opposed to some of their deliberate country efforts that didn’t really cut the mustard in either camp). In the short run, that was good for Day for Night. We could brandish our country identity but still, flashing our Cosmic American Music badges, keep trying to work the pop, rock and R&B in there too. The Louvins were tougher. As brilliant as their singing was and as strong as their material could be, they recorded enough dogs to fill a kennel. “Red Hen Hop”? “The Stagger”? I’m asking you! We’d pick up one or two songs from each Louvin Brothers album, having sifted through the rest with gritted teeth (a mixed metaphor that actually works pretty well in this instance). But things changed in a tectonic way during a Saturday morning drive back home to Portland from Lewiston, Maine, in October 2006. The day was coldly sunny after an evening of torrential rain. Canadian air was muscling in and the wind tossed the clouds around and tugged at the leaves that were left on the trees. For Gretchen and me, it was a Louvin Brothers day after an evening of Maine classical music history. The night before, we’d heard a concert by 91-year-old classical pianist Frank Glazer, marking the 70th anniversary of his New York City debut by reprising the same ambitious program he’d played at Town Hall all those years ago. 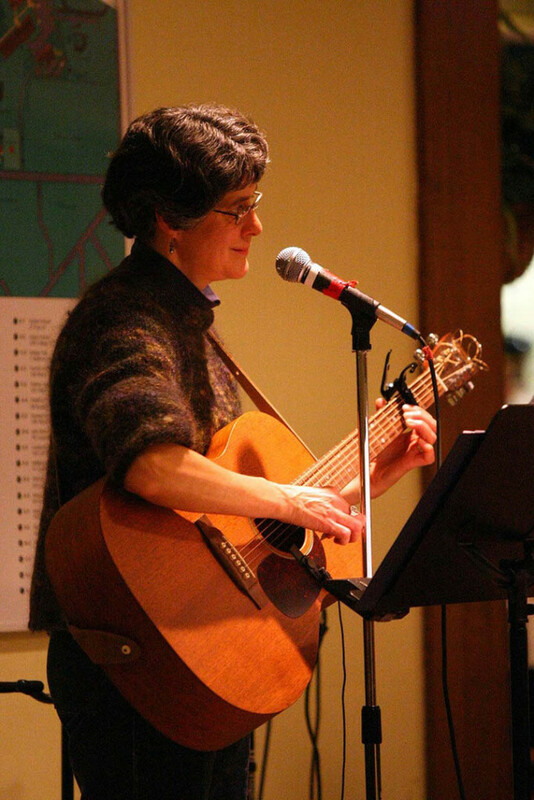 Gretchen Schaefer, smiling and strumming during one of Day for Night’s first performances. The Bobcat Den, Bates College, Nov. 30, 2007. Photo by H. Lincoln Benedict. The concert was inspiring. I felt some sublimal connection between Glazer’s dedication and my own persistence (which isn’t quite the same thing). The dash to the car through the deluge wasn’t inspiring, nor was our night in the dowdy motel next to the turnpike on-ramp. We were glad to head home. 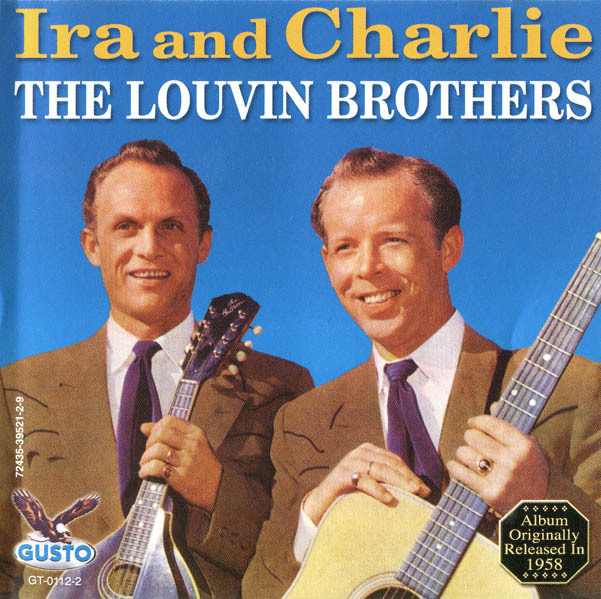 We listened to Ira and Charlie: The Louvin Brothers, from 1958. And Ira and Charlie was a revelation. It was the Holy Grail and the key to the city. We liked everything we heard: Chet Atkins’ Gretschy sophistication mixed with Ira’s out-of-the-blue mandolin fills; Ira’s soaring harmonies against Charlie’s plainspoken soulfulness. The raw emotion in songs like “Too Late,” written by cowboy star Jimmy Wakely, and “Here Today and Gone Tomorrow,” by gospel impresario (and erstwhile Georgia Clodhopper) Wally Fowler, suited us perfectly. And what made that record so influential was not at all exalted or profound. It was simply the intersection of quality and quantity: After months of shopping around for material, the Ira and Charlie windfall gave us a direction and a goal. 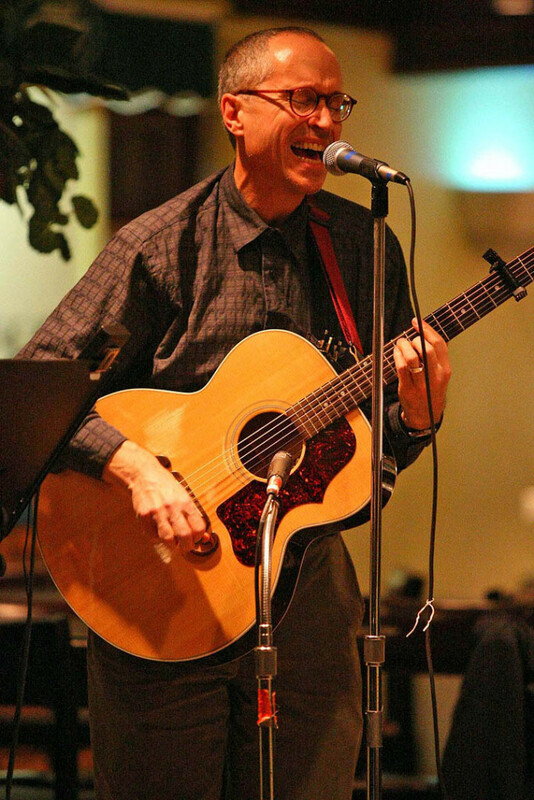 Doug during the Everly Brothers’ “Cathy’s Clown” — the “Magic Fingers” capo gives it away — at Day for Night’s Nov. 30, 2007, show at Bates College’s Bobcat Den. Photo by H. Lincoln Benedict. All we needed was the time to pursue it. And the mental space. Mental space wide open and tranquil. Mental space like the mountain landscapes in Colorado, with the open air, the transfixing beauty and the long views that feel like freedom. 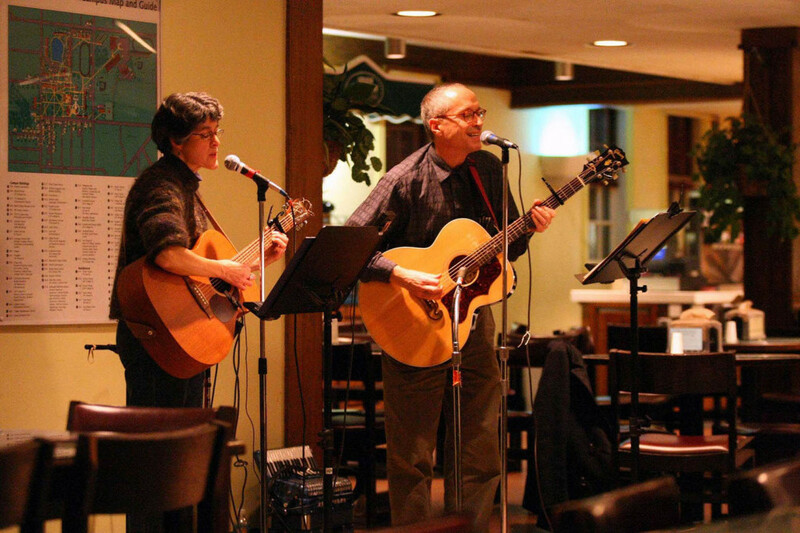 Enjoy Doug and Gretchen’s pre-Day for Night recordings at the Nimbit store. Notes From a Basement text copyright © 2012-2015 by Douglas L. Hubley.